Bike or hike on the Sunset Bike Trail, or challenge yourself on more than 12 miles of off-road biking trails weaving through the woods. Rent kayaks and peddle boats at Nicolet Beach Concessions at famous Nicolet Bay beach, where you can also get snacks, burgers, supplies, and ice cream. The park is also home to the beautiful Peninsula State Park Golf Course, award-winning Northern Sky Theatre and historic Eagle Bluff Lighthouse. The 75-foot Eagle Tower was closed in May 2015 for structural concerns, but is expected to reopen in 2018. 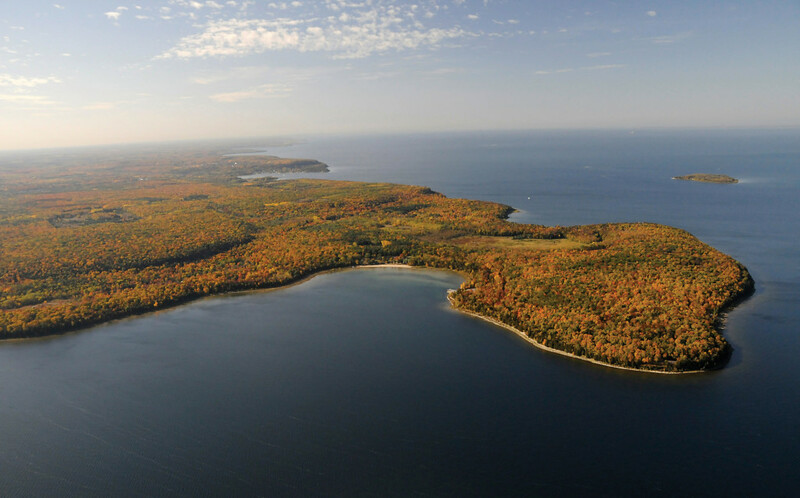 Peninsula State Park, with Nicolet Bay in center, is the crown jewel of the Wisconsin State Park system. Photo by Dan Eggert. 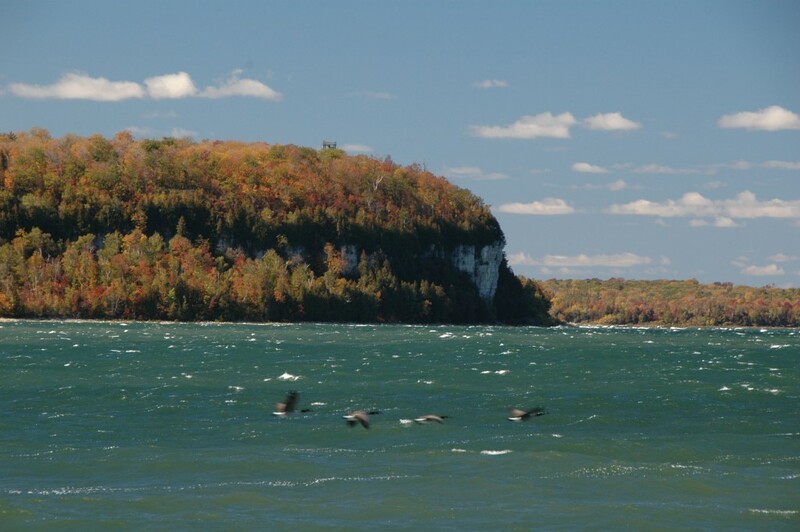 The park features more than 400 campsites that fill up fast on holiday weekends, volleyball courts, environmental programs, nature centers, a bat house, and incredible vistas from Sven’s Bluff, as well as it’s own island, Horseshoe Island, open for exploring. Peninsula opened in 1909 and quickly became one of the peninsula’s most treasured locals. 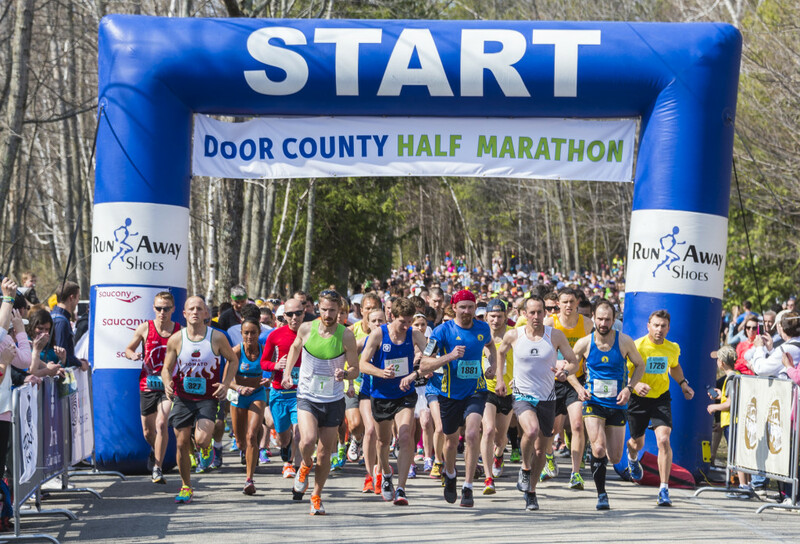 In 2008, the Peninsula Pacers created the Door County Half Marathon, which takes place entirely within the park and has been hailed as one of the best half marathons in America. Sandwiched between Fish Creek and Ephraim, Peninsula Park claims a rich history, including a storied ski jump that once challenged daredevils. Trails: 20 miles of hiking and 13 miles of off-road bike trails. 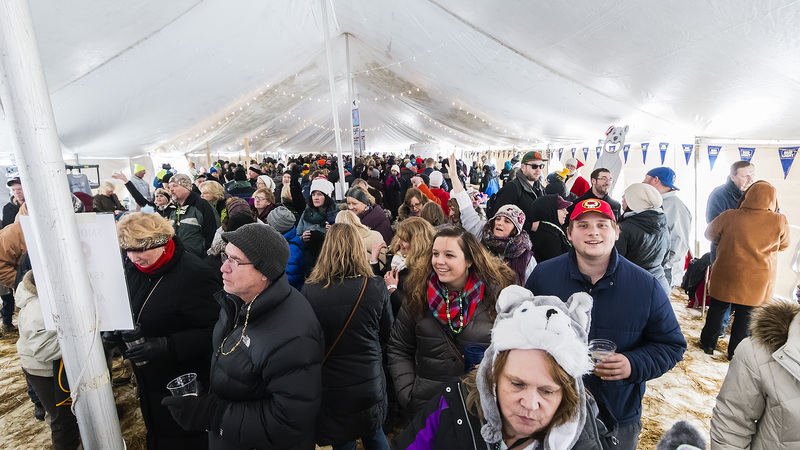 When the State of Wisconsin established a state park system, it didn’t take long to turn their eyes toward Door County. Peninsula State Park opened in 1909 and was formally established as Wisconsin’s second state park in 1910. Though today it seems an obvious choice, it wasn’t without detractors at the time. The Green Bay Press Gazette came out against establishing the park, as did Door County historian H.R. Holand (who owned land within the park). 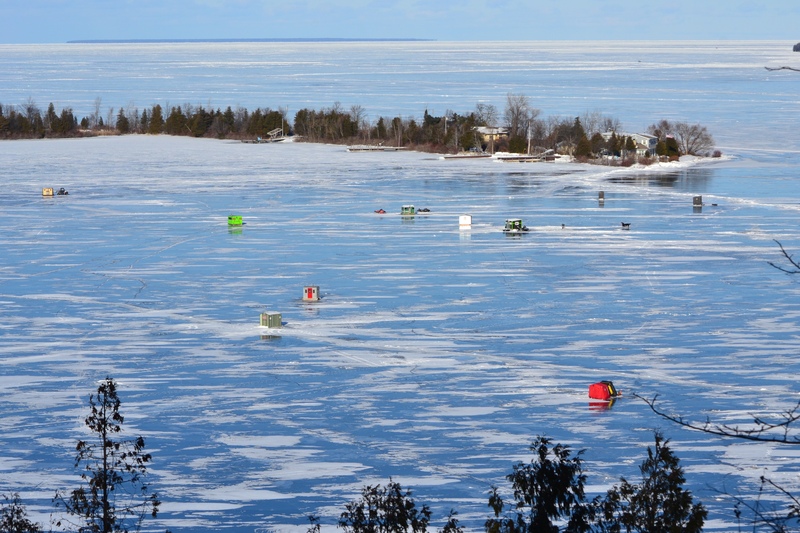 Even the Door County Advocate expressed reservations. But Thomas Reynolds, an assemblyman from Jacksonport, spoke passionately for the park and proved persuasive. Peninsula has become one of the state’s most popular parks, and its most complete, featuring an 18-hole golf course, hiking, skiing, and biking trails, the renowned Northern Sky Theater, historic Eagle Bluff Lighthouse, and Horseshoe Island. Nicolet Bay Beach has been called one of the best beaches in the country, and the Door County Half Marathon, held in the park each May, owes much of its national acclaim to the scenery of the park. The future of the park’s most popular attraction is uncertain. When Eagle Tower was deemed unsafe in 2015, the state announced it would not provide funds to rebuild it. Now the Friends of Peninsula State Park, a group that has grown increasingly vital to park operations, is raising funds to rebuild it. 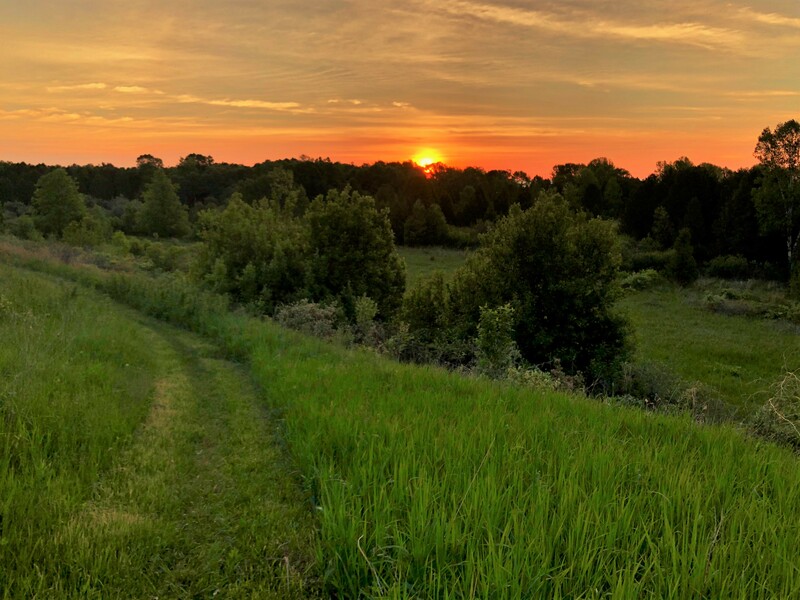 Door County’s tourism industry owes much to the park, not just for the attractions and majestic scenery it provides today. For 108 years the park has served as an affordable vacation spot for families, creating traditions and relationships with Door County that bring people back for generations. 500 BC: Native Americans establish village at Nicolet Bay Beach. 1842: Increase and Mary Ann Claflin settle on what is now Weborg Point. 1868: Eagle Bluff Lighthouse is built on orders from President Andrew Johnson. 1908: Board convinces renowned landscape architect John Nolen to move to Wisconsin to determine the most appealing sites for state parks. He recommends Devil’s Lake, Wisconsin Dells, Wyalusing, and Peninsula. 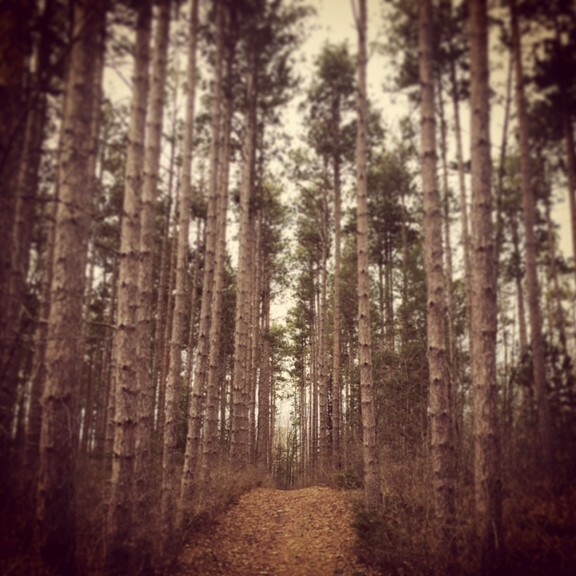 1909: Peninsula State Park land is purchased by the state of Wisconsin for $20 an acre. Park opens. 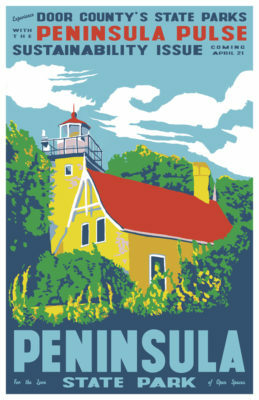 1910: State officially establishes Peninsula as the second state park in Wisconsin. 1913: Albert E. Doolittle becomes park’s first manager. 1914: Towers are built at Sven’s Bluff and Eagle Bluff with hand cut logs. 1916: Camp Meenahga, a camp for girls, is opened by two young widows from St. Louis. 1917: First six holes of Peninsula Golf Course open. 1919: Park records an estimated 20,000 visitors. 1926: Eagle Bluff Lighthouse is automated. 1927: 40-foot Memorial Pole dedicated to the Potawatomi nation is erected by the Door County Historical Society. 1931: Chief Simon Onanguisse Kahquados is buried on the course near Memorial Pole in ceremony attended by 15,000. 1932: Second Eagle Tower is constructed. 1935: A Civilian Conservation Corps camp of 208 men builds stone fences, clears hiking trails and roads, plants trees, and refurbishes the ski jump and toboggan run. Also builds eagle terrace. 1940s: Ski Jump and toboggan run are abandoned. 1947: Sven’s Tower is removed due to dry rot. 1961: Last life leases that enabled people to live in the park expire as residents die. White Cedar Nature Center established in former winter warming house. 1970: Memorial Pole is replaced with pine laminate replica. 1970: James Peterson casts 18 singers and musicians to perform “Song of the Inland Seas” on an old stage in the woods of the park. 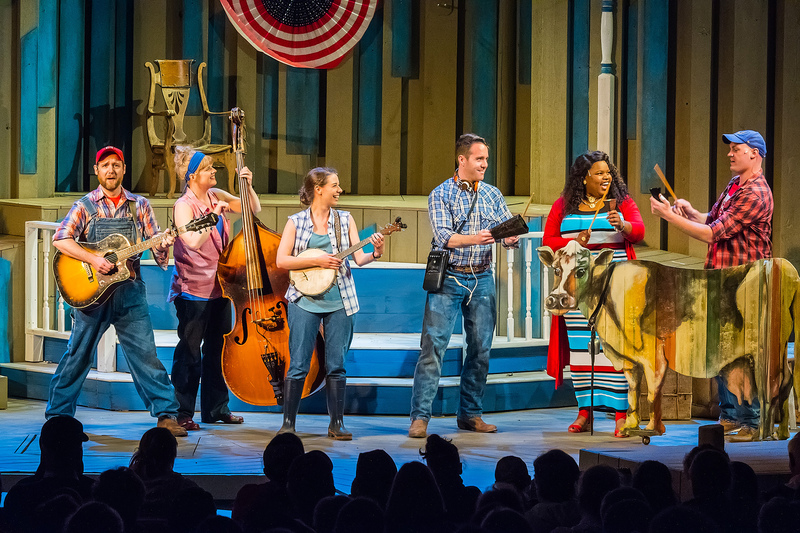 They become “The Heritage Ensemble,” performing each summer. 1981: Peninsula Golf Association reaches agreement to manage golf course. 1982: Sunset Bike Trail surfaced. Computers first used for camping reservations. 1990: Fred Alley, Doc Heide, and Gerald Pelrine transform the Heritage Ensemble into American Folklore Theatre, which quickly earns regional and national acclaim. It is later renamed Northern Sky Theater. 1992: Deer hunting introduced in park. 44 deer harvested. 1996: Park headquarters expanded and remodeled. 2001: Nicolet Beach is temporarily closed when 68 swimmers suffer from gastrointestinal illness traced to E. coli contamination at the beach, leading to regular water quality testing and beach management reforms at most Door County beaches. 2006: University of Wisconsin Press publishes Door County’s Emerald Treasure, a history of the park, by William Tishler. 2009: Park celebrates 100th anniversary. 2014: Peninsula Golf Association opens 6-hole short course for youth play. 2015: Eagle Tower closed for safety reasons. It is dismantled in 2016. 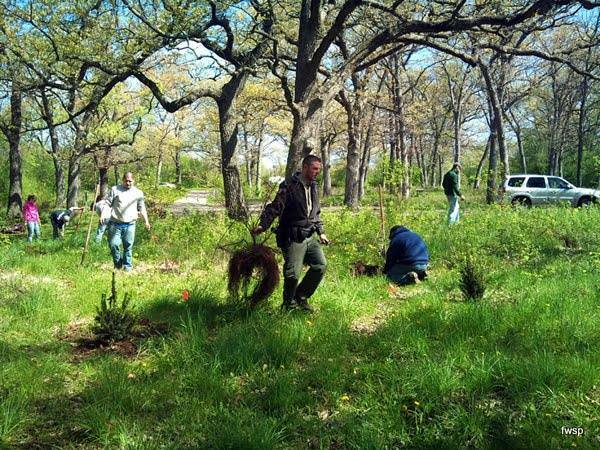 The Friends of Peninsula State Park contribute more than 2,000 volunteer hours each year removing invasive species, improving trails, assisting at the nature center, and raising funds for programs, staffing, and improvements to the park. The group has helped fund a summer naturalist, trail specialist, nature programs, new bathrooms at Nicolet Bay, ski trail grooming equipment, renovate the White Cedar Nature Center, among other projects. In 2016, the group launched its most ambitious endeavor yet, aiming to raise more than $750,000 to rebuild Eagle Tower. 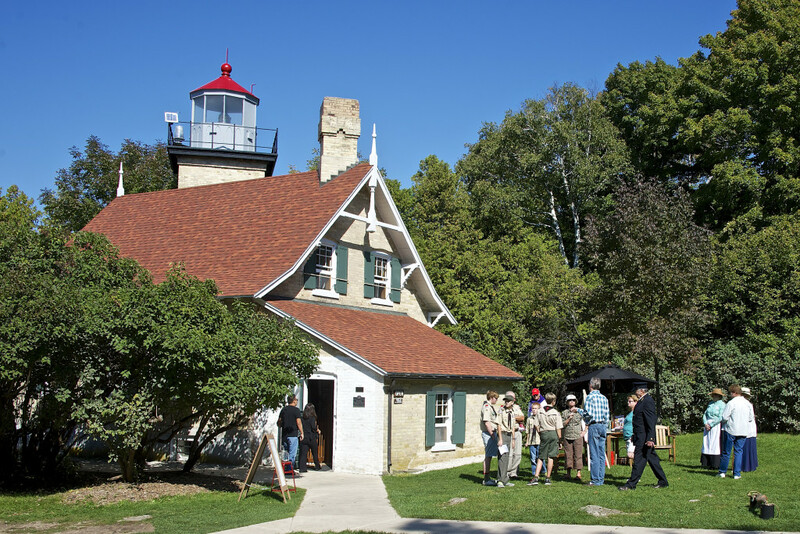 Perched on a bluff 76 feet above Green Bay’s glistening waters, Eagle Bluff Lighthouse’s lamp has protected sailers since shortly after the Civil War. Restored to its past glory, Eagle Bluff Lighthouse Museum is a tribute to the keepers who kept the lamp lit. 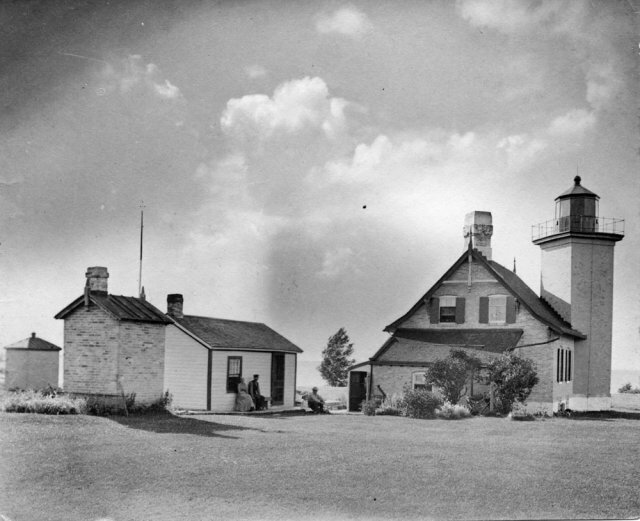 The lighthouse was manned from 1868 – 1926, and remains furnished with some of the keepers’ original furnishings and authentic period antiques, the Eagle Bluff Lighthouse Museum is a story of not only the men who toiled through the night, but also their wives and children. 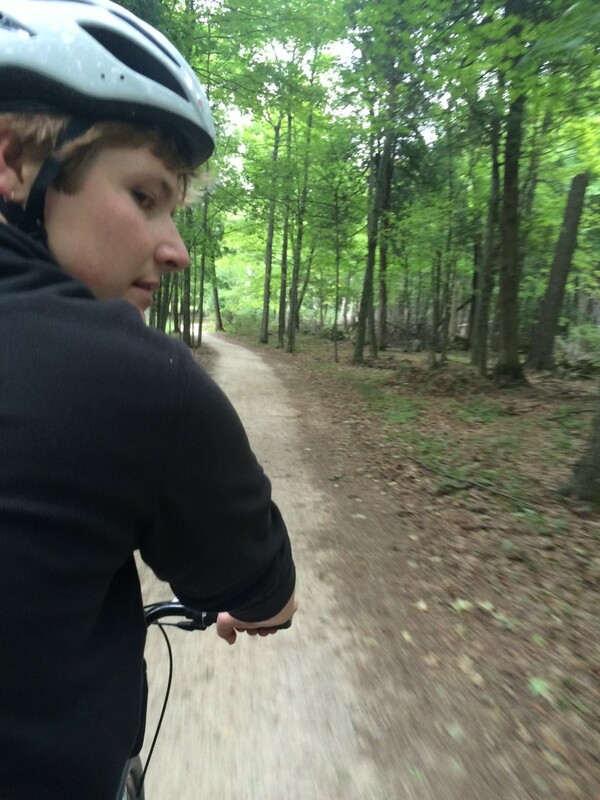 Gabriel Peterson takes the lead on a tandem bike on the Sunset Trail in Peninsula State Park. Eagle Tower was built in Peninsula State Park in the 1930s. Photo by Len Villano. 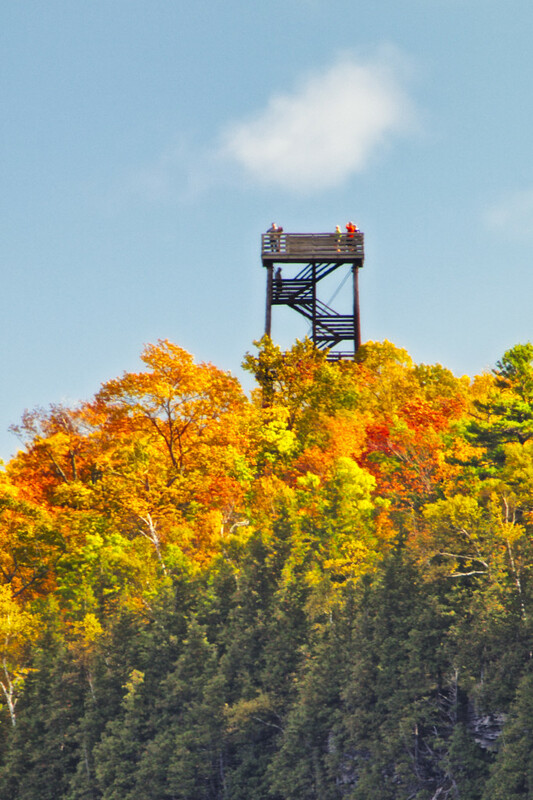 The view from atop Eagle Tower in Peninsula State Park draws tens of thousands of visitors every year. A hiking trail deep in the woods of Peninsula State Park. 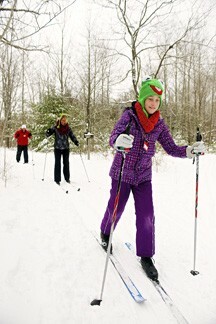 Photo by Myles Dannhausen Jr.
Ava Christian of Appleton leads her mother and father, Felicia and Todd, through the cross country ski trails of Peninsula State Park. Photo by Len Villano. 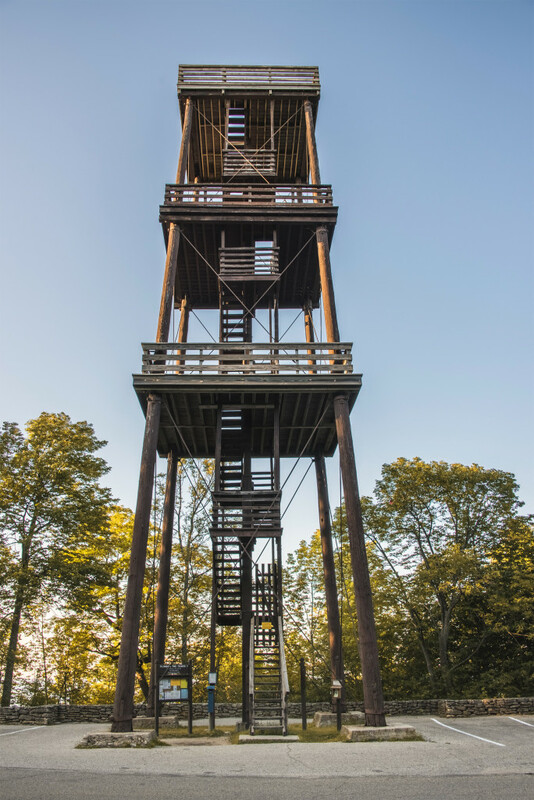 Eagle Tower is one of Door County's most revered sites. Photo by Len Villano. "The name 'American Folklore Theatre' communicates connotations about our focus that are no longer accurate." 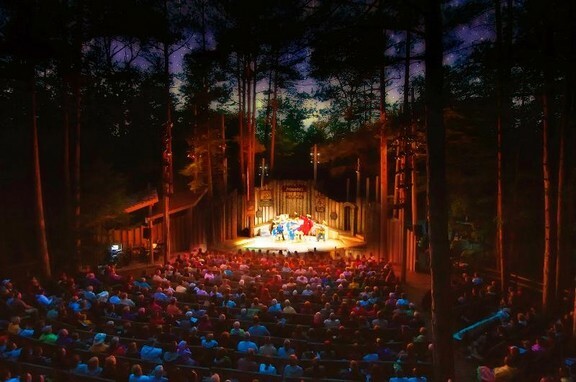 The theatre is tucked into the woods of Peninsula State Park. 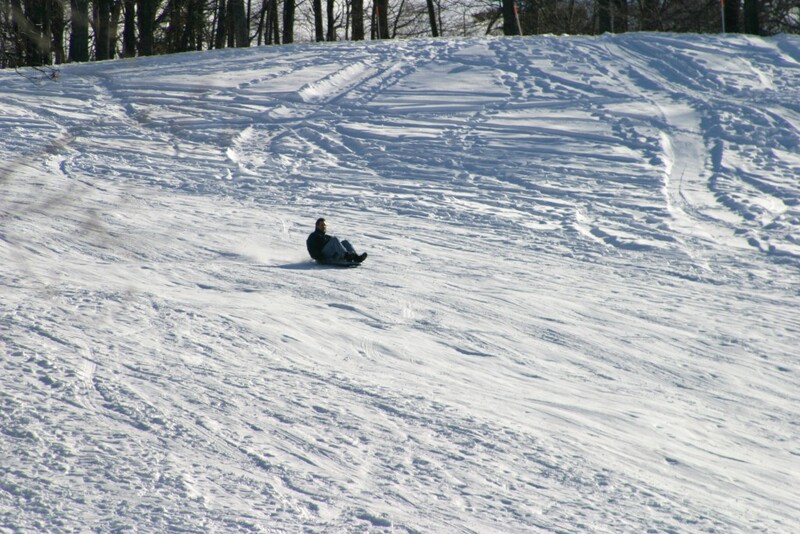 Hill 17 is the most popular sledding hill in Northern Door County. 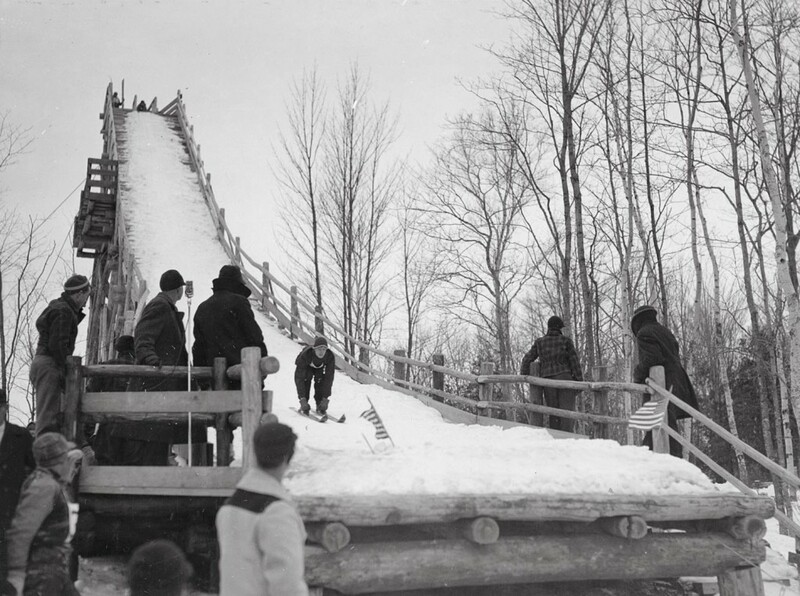 The ski jump in Peninsula State Park was a cooperative effort between the Civilian Conservation Corps, the park and local organizations. Photo courtesy of the Wisconsin DNR. Eagle Bluff Lighthouse. Photo by Len Villano. 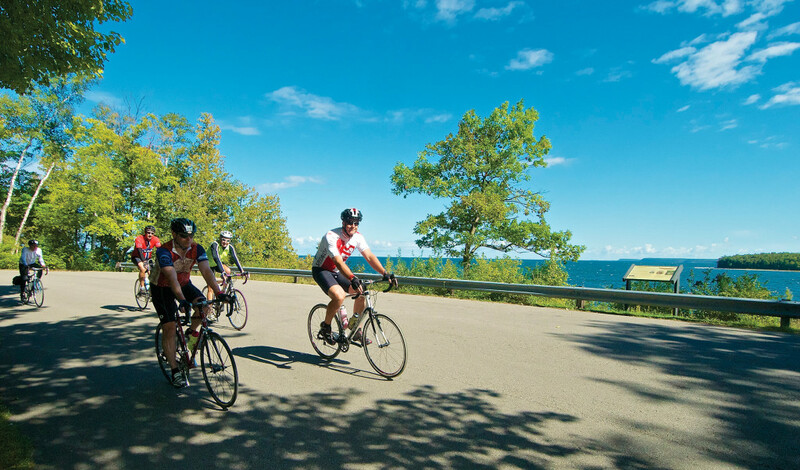 Riders in Peninsula State Park for one of several annual rides that take advantage of the park. Photo by Len Villano.